Michael T. Thompson’s practice focuses in the areas of estate and tax planning, estate administration, disability planning and elder law. Michael is admitted to practice law in New Jersey and New York and before the United States Tax Court. Prior to forming Cestone & Thompson, P.C., Michael was associated with the Tax, Trusts and Estates Practice Group at Coughlin Duffy LLP from 2008 to 2010. Previously, Michael was associated with the law firm of Danna & Associates, P.C. 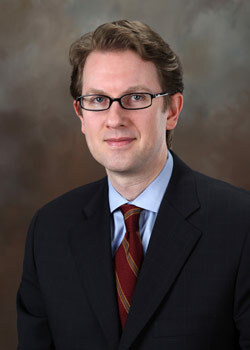 from 1998 to 2008 and served as the Managing Attorney for that firm’s New Jersey office from 2001 to 2006. Michael received his undergraduate degree in Political Science from Rutgers College, his law degree from Rutgers University Law School – Camden and his LL.M. (Taxation) from New York University Law School. He is a member of the New Jersey State Bar Association (Elder Law and Real Property, Probate and Trust Law Sections), the New York State Bar Association and the National Academy of Elder Law Attorneys. Michael is a past member of the Advisory Council for Dress for Success Morris County. Michael is a frequent lecturer to legal, business and community groups. In September of 2016, Michael began a four year term serving on the Supreme Court of New Jersey, Office of Attorney Ethics, District VB Ethics Committee.